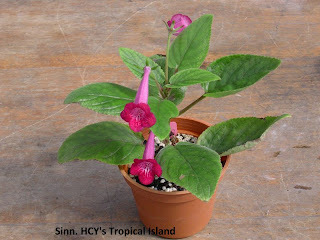 This new HCY's hybrid of Sinningia shows a nice combination in color and plant form by using Sinn. reitzii. The plant is compact , it doesn't grow tall as Sinn. reitzii , but the red color of Sinn. reitzii is descent. 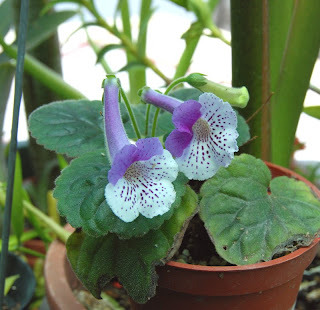 A very remarkable plant. 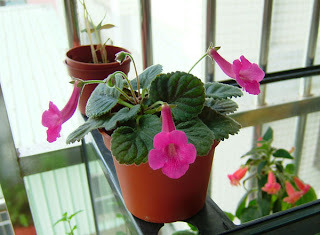 I got this plant from Vivian Liu for the purpose of making cross on mini sinningia. 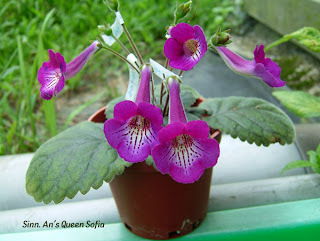 I found this is a very nice mother or pollen plant. 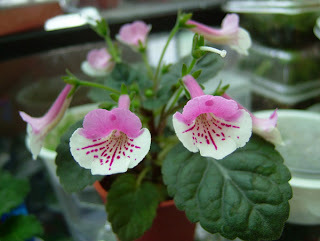 Easy grower and always in bloom. I may write some offsprings of An's Queen Sofia in the future. 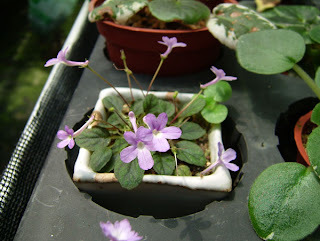 To be honest , this plant is a souvenir of my first try to make cross between mini sinningia. To name it is not because it's an excellent offspring but due to it's a ..... well .... just a souvenir. :) The bright rosy color inspired me the image of rose garden under sunshine. A decent sinningia for me. 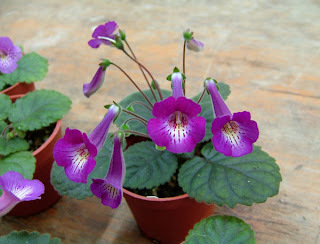 When began to grow Sinningia , "Mark Twin" was one of my first collection. 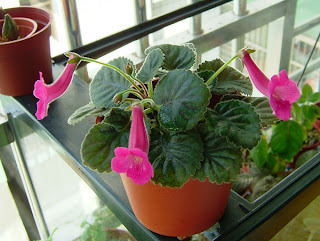 Its flower is showy , large and nice shape. 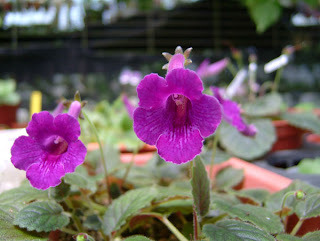 We should say this is a classic icon of purple/blue Sinningia hybrids. I gorw this plant over years and still adore how handsome it is. Sinn. Little Wood Nymph is a Micro Mini Sinningia hybrid between Sinn. pusilla and Sinn. concinna. 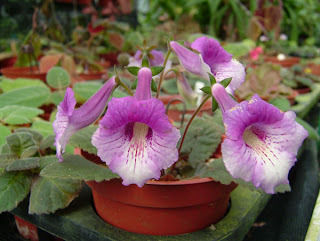 The flower shape is half way between the two species. 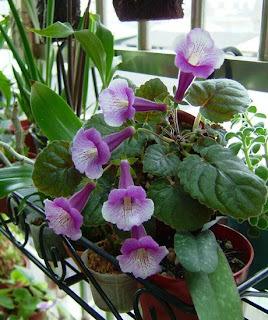 It blooms well in spring time in Taiwan , it seems cooler temperature helps a lot to enhance the growth and enrich the flower color. 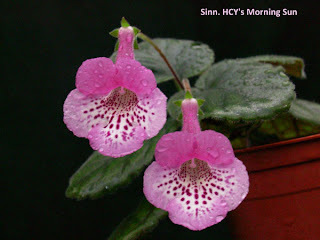 This Sinningia is definitely an eye-catching plant !!! The Pirate's series is newly announced , it's "Made in Taiwan" :-) Lovely spotted on the petal , also features lavender on upper 2 lobes and white on lower 3 lobes. I saw this photo last year from my friend Campbell. I would say this is an outstanding mini Sinningia , I can't find a second similar so far. The color is so bright rosy with remarkable spots. Since the flower presentation is wonderful , it's not a big problem when it's not a really heavy bloomer. 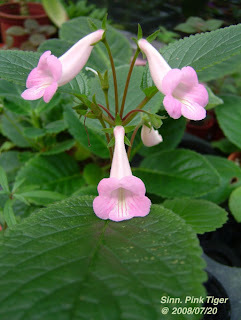 Green foliage and compact size , a recommended must have in your Sinningia collection. 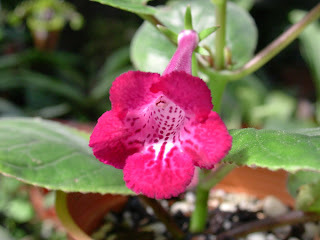 Large flower shape , tender color and spots , this mini sinningia is lovely. I got this plant from Mr. H.C.Y. 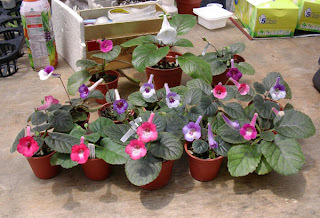 who is the famous Sinningia grower as well as a hybridist in Taiwan. I think "HCY's Morning Sun" is one of his best Sinningia. 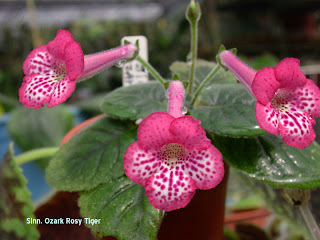 This is also one of a kind in An's Sinningia Hybrids. Upper two lobes in pink , lower lobes white with red stripes and spots. 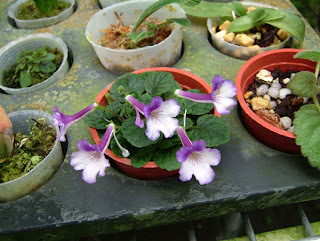 An's Bom Dia is a super bloomer , compact and smaller foliage than other miniture Sinningia.